Her big day arrived Saturday – client Sarah had her dream wedding in her size 10 dress! The story begins at the start of the year when Sarah was a size 18 and over 3 and a half stone heavier. Sarah, who works 12 hour shifts including nights, followed the advice she was given from day one and the results show. She made no excuses and always showed up for her training sessions and has been organised with her eating plan. After the wedding (2 days ) getting in a final training sesh before the honeymoon! Sarah has been a model client and it was great having a few weeks in hand towards the end of her program where she was actually a bit too small for her wedding dress! 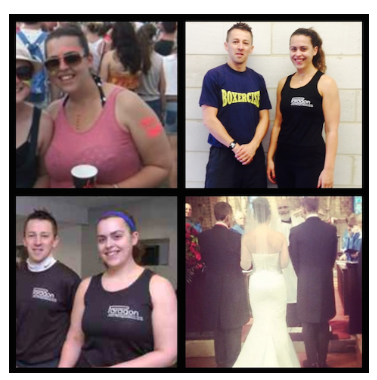 “I wanted to start training to feel and look better about myself in time for my wedding in Nov 2014. I knew I needed something more than just going to a gym to get the results I wanted but I couldn’t put my finger on what it was. I first came to Paragon for a free trial for some yoga. I met Robbie at the front door and felt at ease straight away and everyone was warm and friendly. Shortly after I spoke with Robbie about my goals and started my journey at Paragon. I always dreamt of walking down the isle in a size ten wedding dress to meet my now husband Tom. The first few weeks was hard. I was training up to 6 times a week and following Robbie’s detox plan but I only lost a few lbs. Then I did my first months measurements and lost over 10 inches from across my body. Everything started to fall in to place from then. I lost over 30 inches in the 3 months of taking part in the Platinum Program. If you are serious about achieving a health and fitness goal that involves losing weight, getting fit and feeling more confident – get in touch as we love helping people that are serious about achieving a goal.